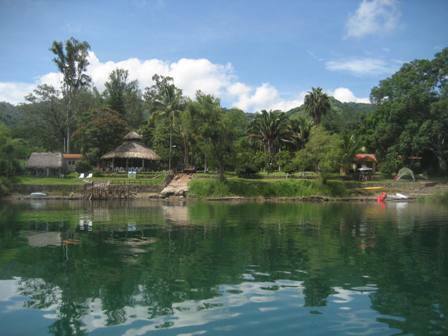 LA LAGUNA DE SANTA MARIA DEL ORO near Tepic, Nayarit, is one of the many quiet, unspoilt and exceptionally beautiful locations that an adventurous and nature loving traveller may visit while in Mexico. The area offers a welcome variation from the much visited beaches and huge tourist complexes of the nearby Riviera Nayarit. A visit of a day or two can provide a relaxing break while travelling between Tepic, Nayarit, and Guadalajara, Jalisco. The beautifully conserved crater lake is well worth a visit. Popular activities include hiking, birding, fishing, kayaking and swimming. Take the Santa Maria del Oro turnoff from highway 15 or toll road Guadalajara-Tepic, drive through the town, past the lookout point and continue on the winding road to the lake. Arriving at the lake you will find us 300 meters to the left. If you require a booking or more information in order to make a reservation please let us know how many persons are in your group and the dates you would like to reserve. We will reply as soon as possible (usually within a few hours) Please ask for our RESERVATION POLICY. KOALA BUNGALOWS offers the best value for money at the lake with a room for $800.00 daily and bungalows from $1,000.00 pesos The camping fee is around $80.00 pesos per person per night and a R.V. site for two persons is $220.00 per night. 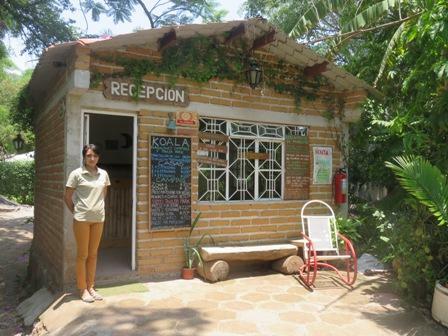 The many restaurants at the edge of the lake serve the now famous 'chicharron de pescado´ (deep fried morsels of battered fish) Our pleasant and affordable lakeside restaurant ´La Mojarra de Samao´ has a varied and inexpensive menu.